We began our morning safari just before dawn to catch a glimpse the famous Dhikala Sunrise. Along the safari tracks we noticed that the overnight dew had transformed the Dhikala Grasslands into a sea of pearls. It looked as if a skilled artist had handpicked the best of these pearls and strung them together to create this gorgeous piece of art. 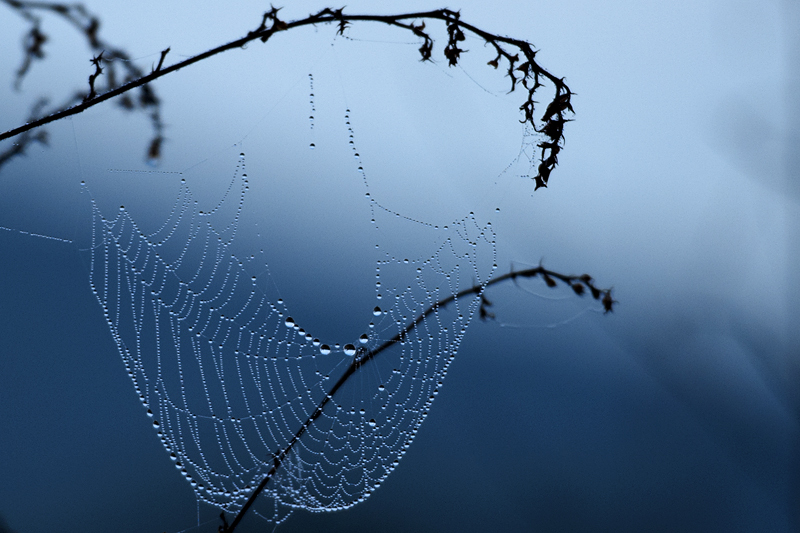 And he did so by using the strands of this unassuming spider’s web. We soaked in the beauty as the sun rose to a bright new morning. 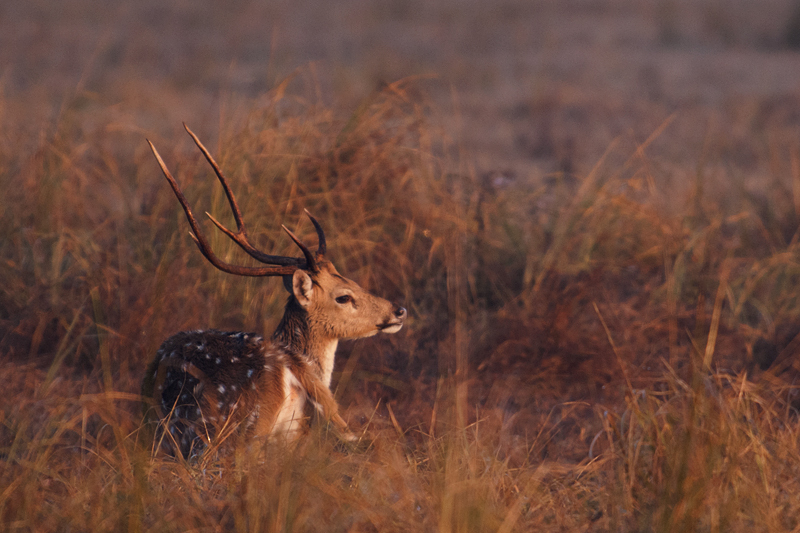 After watching the spectacular sunrise, we drove further into the Dhikala grasslands in Corbett National Park when we saw two Chital (Spotted Deer) stags standing together. At the beginning they weren’t close enough to be composed within a single composition with the D300, 300mm f2.8 with 2x TC. But something about their posture indicated that they might get into a sparring bout. We switched off the engines and waited patiently for a few minutes. It didn’t take long, before one of the Chital stag assumed a dominant posture and approached the other Stag slowly. Soon I could see both the Chital Stags through the viewfinder. We knew that if the other Stag did not take a submissive posture soon enough, there will be a sparring bout. The thought of photographing these sparring Chital Stags in the Dhikala grasslands was an opportunity we would happily accept any day. 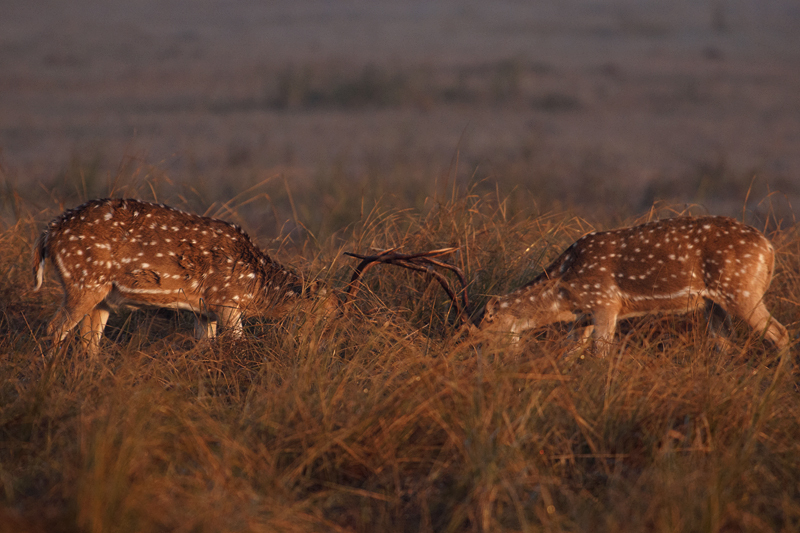 Soon enough the Chital Stags locked horns and slowly it turned into a full blown sparring match. We had great fun watching and photographing them in the golden morning light. 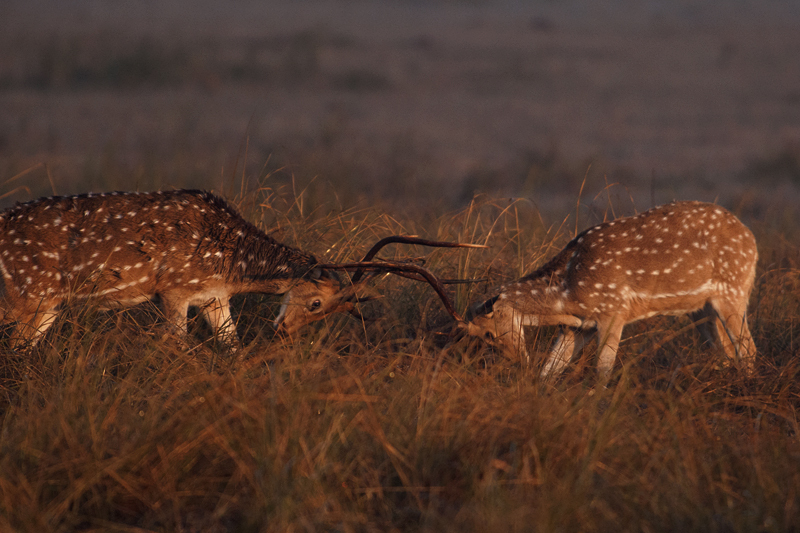 We had witnessed Chitals sparring a couple of times before and it was posted in Sparring Partners – Chital. 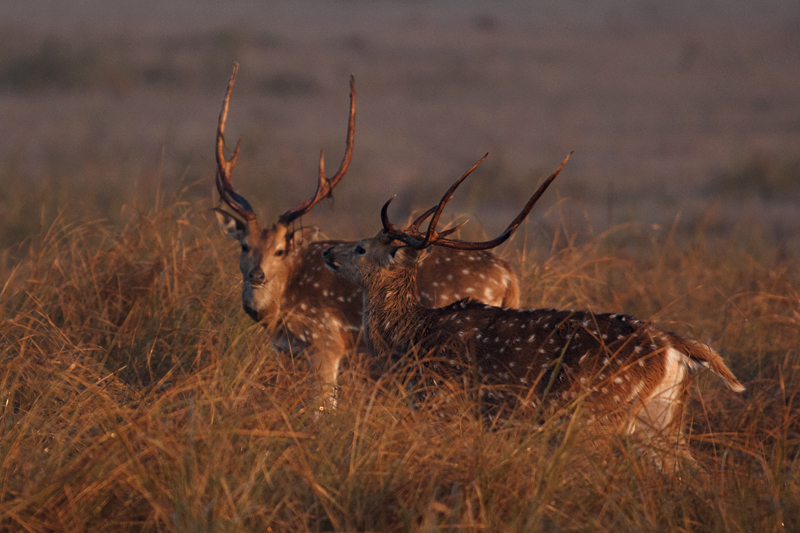 For a more interesting interaction you might want to check Chital – Favorite prey species. And finally the strong-hearted can watch the gut wrenching post on Dholes (Wild Dogs) feasting on a Chital kill.